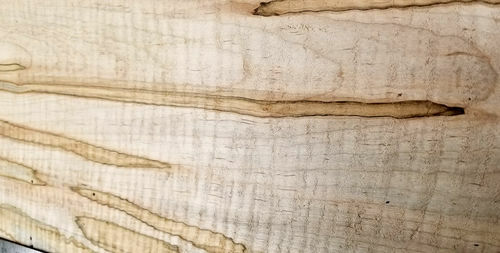 I have a 2” thick slab of curly maple that I want to use for veneer. Even though I’ve scoured the internet for useful information. I am still unsure on how to proceed. First of all, I have never veneered before and I have no specialized equipment such as a press or vacuum setup. If I must invest on specialized equipment, I will, because I also have other very nice boards that really should be used as veneer. I’m thinking that, with curly maple, I shouldn’t cut the veneer too thin. That’s a gut feeling with no hard data. So, how thick can I cut veneer and still be able to hammer veneer it? Believe it or not, I could not find an answer to that question on the net. Is 1/8” too thick? If I need to cut the curly maple thicker, and that’s too thick for hammer veneering, can I get away with platens and clamps? The pieces I’m veneering will be about 20’ x 20’. As far as which glue to use, there is no lack of opinions on the net. I’ve been asking a lot of questions on this forum and getting some great advice. I hope that I’ll be able to “pay it forward” in the coming years. One of the things I like to do is to resolve my threads. That is, after I get the advice, I like to post how I finally resolved my problem, so that it could help others in the future. Anyway, thanks again for any help you guys can provide. How do you plan on cutting the veneer sheets? I’ll be cutting the veneer on my bandsaw with a 1/2” trimaster blade. I’m relatively confident that I can resaw to whatever thickness I need. I see that curly maple is sold in very thin veneer, so unless someone tells me it’s a bad idea, I’ll try to cut some 1/16” veneer from the slab, book match it, and hammer it. I like 1.5 mm (1/16”) as an optimum thickness. It will hammer veneer just fine as will thinner stock. Thicker may act more like solid wood as mentioned above. The veneer in this video is .8 mm (1/32”). Thanks, Paul. Time to get some hide glue veneering supplies. I’ll post how it comes out.